This weatherproof, 23x31" Black Portfolio with Adaptable 6" Gusset from Start by Prat features a touch-fastened front flap closure revealing two interior pockets, a zippered and an elastic slip pocket for accessories. For greater visibility inside, there is a gray lining, and for protection on the outside, there are reinforced rubber corners. The portfolio is made from nylon Cordura and can be carried around using the dual-grip handle at the top or the removable, adjustable shoulder strap. 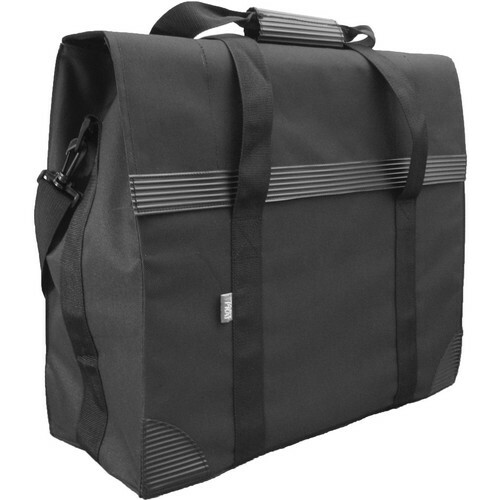 Box Dimensions (LxWxH) 32.0 x 24.8 x 1.0"
Black Portfolio with Adaptable 6" Gusset (23x31") is rated 4.0 out of 5 by 1. Rated 4 out of 5 by Clive from A good value bag overall. I bought this bag to keep various textured boards for small product photography. I had thought about a regular designer A2 portfolio case but the depth (6) of this product is more useful and I didn't need the ring binder for sleeves. The shoulder strap doesn't fit so well, but personally I doubt I'll use it much so it's not an issue. The bage/case would be improved if it had in interior hard frame to support the shape, especially the base/floor. I didn't so I cut my own - works well.